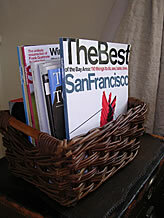 The best style of storage for the person using the stuff. 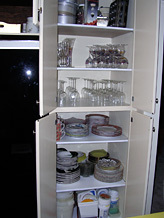 Extra storage for linens and china. Sometimes creating the most functional and attractive space for everything you need in your home or office means you absolutely need to create more storage. Do you put an addition on the house or add some of the following? Appropriate hanging fixtures for clothing, tools, sport equipment, etc. Making things visible allows you to see how much you have. Successfully finding space, where there appears to be none, is the primary challenge and always a fun one for me. Before I try to create storage, I like to determine what activities or jobs need to happen, what supplies or tools will be used, and the best location to set up the system. 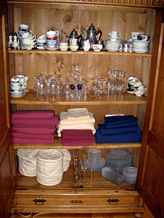 Usually, we like to see how much “stuff” needs storage before going out and buying anything. In the process of looking at “how much stuff,” we often discover things to donate, dump, give away or sell. The end result is attractive and efficient … allowing you to live and work more creatively. Having a container that forces you to limit your reading material keeps you from burying yourself in unreasonable expectations. 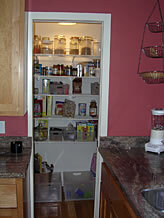 Adjustable shelves allow for changing needs and a convenient location below for recycling with sturdy transfer containers. 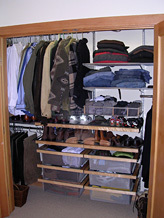 This bedroom was too small for a dresser so the closet was designed toprovide some drawers. Installed in one day--- it made the move-in easy. 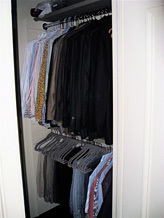 Men's clothing often requires adjusting the height of hanging bars. 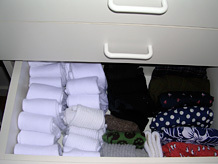 Sorting clothes by color and style makes it easier to see how much you have. 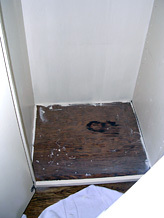 Old kitchen cabinet - before. A fresh coat of paint, new shelves and an entertaining lifestyle transforms this kitchen without a remodel. We wear 20% of the clothes we own 80% of the time. The rest hang there, just in case.